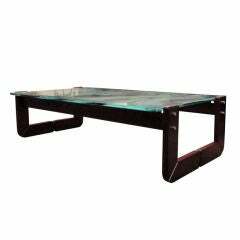 Wonderful red leather and wood two-tier coffee table from Italy, 1970, attributed to Poltrona Frau. One dark one light wood top, great patinaed leather cladding on detachable casters. 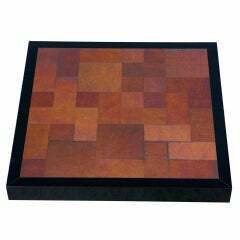 Wonderful ceramic tile, wood and stainless steel coffee table by Svend Aage Jessen & Sejer Pottery for Ryesberg Møbler, 1970s, signed by Sejer Keramik, in great condition. Bold Danish modern, solid oak coffee table by Kurt Ostervig for KP Mobler, 1965, oversized, sturdy oak frame in great condition. 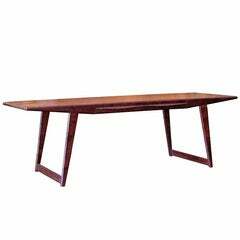 Pair of Italian bamboo coffee tables from 1970s These Coffee Tables are sellable separately. Measurements: cm.83 x 83 x H 22. Inox 1970s coffee table. 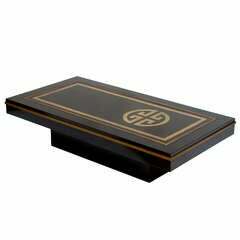 Black laminated base and on top a nice simple graphical artwork. 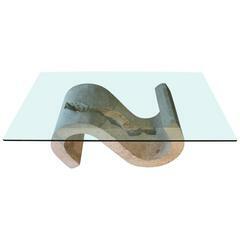 1970 "S" sculpture coffee table in travertine and tempered glass.